We keep hearing from those opposing health care reform that our health care is the “best.” But it isn’t. This from the NEJM Jan 6, 2010. Despite the claim by many in the U.S. health policy community that international comparison is not useful because of the uniqueness of the United States, the rankings have figured prominently in many arenas. It is hard to ignore that in 2006, the United States was number 1 in terms of health care spending per capita but ranked 39th for infant mortality, 43rd for adult female mortality, 42nd for adult male mortality, and 36th for life expectancy. Comparisons also reveal that the United States is falling farther behind each year (see graph). In 1974, mortality among boys and men 15 to 60 years of age was nearly the same in Australia and the United States and was one-third lower in Sweden. 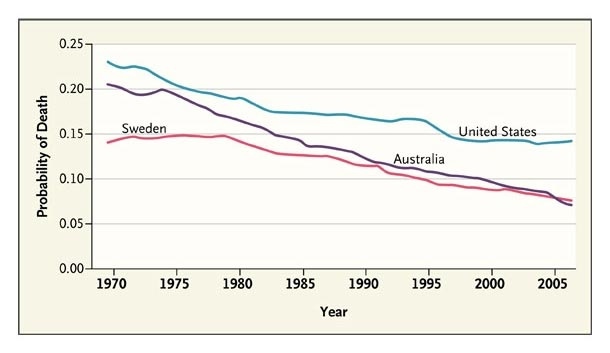 Every year since 1974, the rate of death decreased more in Australia than it did in the United States, and in 2006, Australia’s rate dipped lower than Sweden’s and was 40% lower than the U.S. rate. The article goes on to describe the many opportunities, with the advent of health reform, to improve our non-system. These may be exciting times. This entry was posted in General Cynicism, Statistics. Bookmark the permalink.